Back at Beerus’s place, Xeno Goku and Vegeta return to their own time with the threat of Fu and Cumber past. Vegeta is pissed. 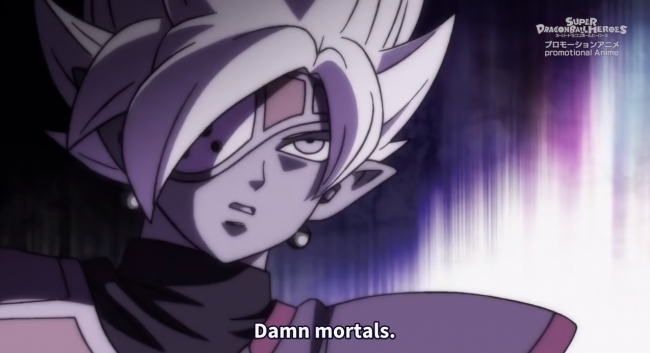 Before he can voice his frustrations the Supreme Kai of Universe 6 shows up. Champa is un-contactable for some reason, and so Vegeta grabs the kai by the lapels and threatens to help him. I mean, he offers to help, but he does it in a pretty aggressive way. Maybe he’s angry that Goku managed to switch on the white hair again. 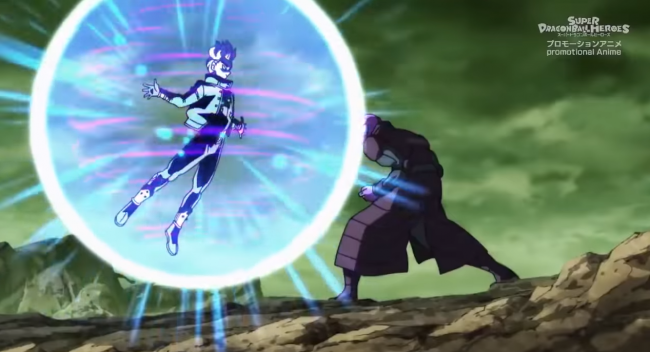 In Universe 6, Zamasu’s robotic lackeys seen in the previous episode are battling against Hit and the Universe 6 Saiyans. These two look like a combination of Androids #17 and #18 merged with Jaco. And that have that same smug gittiness that Fu has about him. They seem quite powerful though as they make short work of Universe 6’s strongest. I actually kind of take exception to Hit’s portrayal in this episode. I really like Hit a lot, mostly because he has a very unique fighting style, even not taking his time skip abilities into account. Which conveniently don’t work on these enemies. The way he’s fighting just seems very generic looking here, much like the Ultra Instinct fight against Cumber. The actual combat is very basic in Heroes, the most creative thing comes from Caulifla getting a surprise attack on the female android. And that’s only because she pulls a daft face. That being said, the animation is decent in this episode. After taking a few hits, the two androids restore themselves to full stamina, which seems like it’s showing off considering how one sided this fight has been. And in what has quickly become a Dragon Ball tradition; Cabba gets the shaft and is already out of the action before the fighting begins. Vegeta and Trunks show up just int time to confirm the jobber role that both Hit and Cabba are probably going to fulfil for the rest of Dragon Ball. We cut away to a mysterious elven looking chap in a fur coat and Punished Zamasu watching the battle unfold. 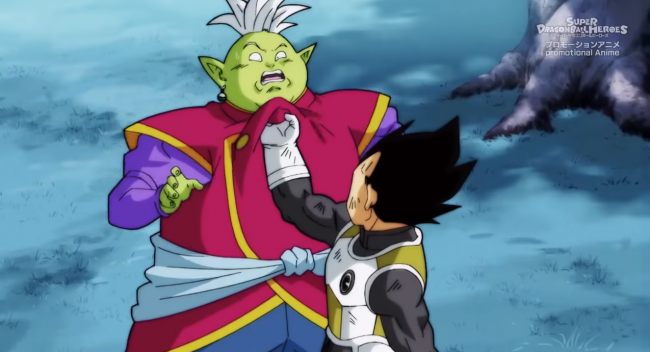 The man in the coat tells Zamasu he needs to hinder his rage at the Universe 7 saiyans until they “deal” with the Omni-Kings. Ooh ominous. The two androids seems to be having a slightly harder job dealing with Trunks and Vegeta, so announce they’re about to “do their thing”. Which probably means fuse in some way. I actually really liked this episode. It felt like a story that could take place in the main continuity. The whole “what if?” aspect of the show I thought it would have going in felt completely squandered in the first story arc, the most interesting thing to happen being an appearance of Super Saiyan 4 Vegito. This episode already feels far more interesting. Involving Zamasu and some brand new characters. Not to mention Universe 6, which I have a big soft spot for in its entirety. It’s just a shame Hit is never going to do anything useful ever again. The upcoming story involving eliminating the Omni Kings seems really interesting too. He did it, he said the “N” word. Unleash your applause. 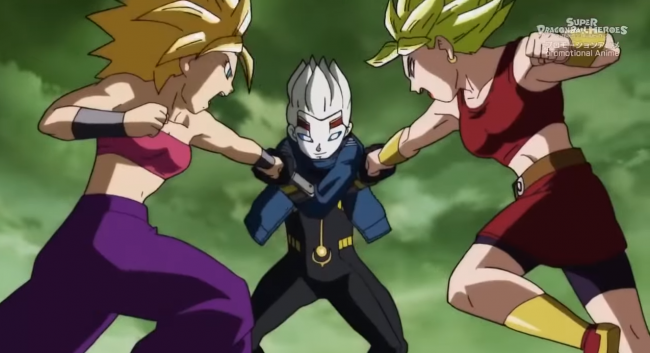 For the first time ever, I end an episode of Super Dragon Ball Heroes genuinely interested to see what happens next. And not a Goku to be seen. 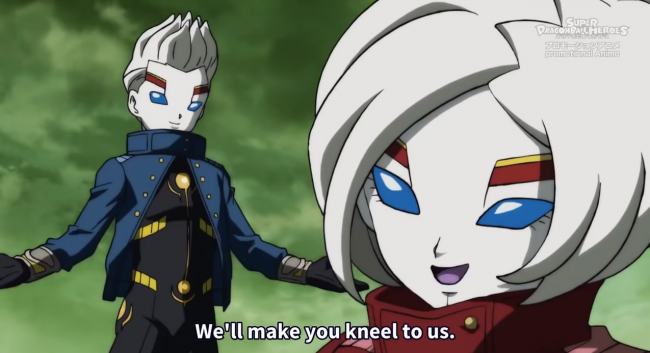 Posted on January 17, 2019 January 15, 2019 by WooderonPosted in Anime, Condensed Reviews:Tagged dragon ball, epsiode 7, hit, super dragon ball heroes, trunks, universe 6, vegeta, zamasu.